For many of today’s busy homeowners, the patio can be a magical retreat: a place to entertain, grill out and just relax. 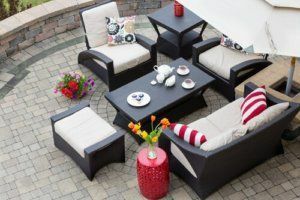 Creating the perfect outdoor space for you and your family begins with the actual foundation of this outside living space: the patio materials. The type of materials you choose can have a major impact on the overall appearance, functionality and durability of your patio area. Before you decide on a specific type of patio, first, it’s important to try and envision the finished space. You may already have a pretty good idea of the location and approximate size, so grab a chair, take it outside and position it in the intended spot. Next, sit and try to imagine each type of material. Remember: your patio should not only complement your house and surrounding landscape, it should also enrich your lifestyle. For example, if you have a larger size space to work with, try incorporating a combination of paving materials; in fact, some of the best designs include two or more. And when you utilize multiple materials, you can more easily integrate inlaid borders that can visually separate an area for resting and relaxing from the outdoor cooking area. Poured concrete is a patio material of choice for many of today’s homeowners because it’s structurally sound, affordable and can be stamped or dyed to imitate higher-end paving materials. It’s best suited for moderate to warm climates. Available in a wide range of colors, bricks can create a warm, inviting and attractive area. This classic patio style often costs a bit more than one constructed from concrete. The reason is not just for the materials themselves, but also for labor, a consideration when you realize that every brick must be set by hand, leveled and grouted. If this is the route you decide to take, you can design the space with a variety of patterns, from a traditional running bond to a style with added textural appeal, such as herringbone or a boxed basket weave. Usually created from cement, cinder or stone, pavers top the DIY patio wish list for their inexpensive price tag and easy(ish) installation. Remember: if you plan to actually lay your own patio, you will need a suitable substrate consisting of at least three inches of sand, as well as a permanent border, like a poured concrete curb, to keep the pavers from moving. The popular, natural appeal and look of stone comes with a steeper price tag, especially if your choice of material isn’t locally available. For many people, flat, irregularly shaped stones offer a calm, relaxing effect, while uniform-cut slabs of granite, travertine or slate can create a more formal patio. This material is available in ceramic, glass, porcelain, terra cotta and natural stone. Tile creates beautiful mosaic patio designs that are cool underfoot, especially in hot climates. Remember: because tile is thin, it requires the installation of a concrete slab. If you are not thrilled with the idea of rock-solid patios, crushed stone, pea gravel or sand can be more your style. They are available in variety of colors and textures at extremely affordable prices. Don’t forget to install a solid perimeter to keep the loose material from spreading outside its intended border. Outdoor living spaces can give you the perfect way to enjoy Arizona’s unique environment to the fullest. Contact Republic West Remodeling, Phoenix’s leading remodeling contractors, today for details about how we can help transform your outdoor living area.